Coming from humble athletic beginnings, Alison has become passionate about encouraging new athletes into the sport of triathlon. Alison is a volunteer and committee member for the TriMuskokan Triathlon series in Huntsville, Ontario. Few things make her happier than hearing a new athlete at a finish line say "I had no idea I could do what I just did!" Alison had a phobia of open water swimming when she first moved to Muskoka in 2008. Learn about her growth and transition into athleticism as published in the Huntsville Forester. 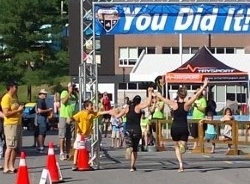 Alison crossing the finish line with a friend and first-timer triathlete. Alison knows what it takes to overcome poor self-esteem and a lack of belief in herself to accomplish goals. Through her involvement in TriMuskoka Triathlon Club, Alison is able to meet new-comers and encourage them along their journey in athleticism.